Approximately 77 people have been killed in mountain villages hit by floods and landslides caused by intense rainfall in Indonesia’s Papua Province, according to the latest information reported by Indonesian authorities. More than 4,000 people were forced to leave their homes. Some of them have been provided shelter in government office building. Floods have damaged two bridges. Fallen trees and debris have blocked several roads. Floods have also caused power outages in the area. Papua province officials report that more than 36 people remain missing. Sentani district has reportedly suffered the most damages – water levels in the nearby river had increased dramatically around midnight. 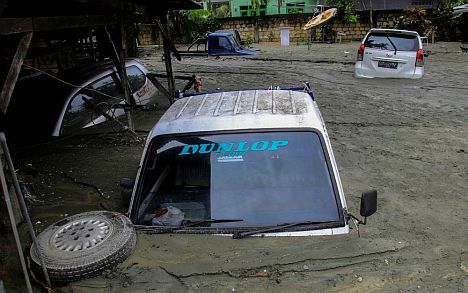 Within minutes a heavy stream of mud ran through more than 300 homes, damaging property and taking lives. Due to the flood, authorities decided to temporarily close down Sentani International Airport on Sunday, 17 March. A state of emergency has been declared in Papua province.